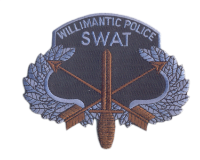 The Willimantic Police Department Special Weapons and Tactics (SWAT) was created in June of 1999. The tactical unit is a division within the Willimantic Police Department which serves a community of approximately 17,000 residents, as well as the town of Plainfield. Within the Willimantic community the city is home to the Windham Community Memorial Hospital, as well as the Eastern Connecticut State University campus. The nineteen member tactical unit is directly supervised by a Tactical Team Commander. SWAT operators are trained specialists who resolve high-risk tactical situations. The SWAT operators specialized training and flexibility allow the tactical team to engage in hostage situations, high risk warrant services, search and seizure operations, active-shooter scenarios, as well as many other high-risk circumstances. Willimantic SWAT also has four NTOA or FBI trained Hostage Negotiators assigned to the team. All of these negotiators are also entry trained operators. All members of SWAT have to endure a battery of entry level challenges prior to his or her selection. The officer must have at least three years on the department, have no disciplinary history, must obtain above average ratings on yearly evaluations, be able to work as a member of a team, in addition to range qualifications that are well above the department requirements, and be in excellent physical condition. If selected, the officer is required to successfully complete a two week basic SWAT school which is taught by members of the Capitol Region Emergency Services Team. All operators will then be on a probationary period of one full year. The team Medical Officer is responsible for acquiring and maintaining important medical history, immunization status and current health status of each member. He also ensures the transfer of information to appropriate medical personnel to save valuable time during the treatment of injuries and illness. He develops an appropriate self-aid/buddy aid program for team personnel. He takes pride in providing field medical treatment to team members injured or taken ill while engaged in mission activity. He ensures that team members are afforded the best possible treatment and are transferred in a timely manner to an appropriate level of care. He provides humanitarian medical assistance to non-law enforcement personnel injured or taken ill during an operation until appropriate transfer to the EMS system can be safely effected. He serves as the patient advocate for Officers who are treated by other medical providers. He is also tasked with conducting Medical Threat Assessments to determine the potential impact of medical/health factors on mission outcomes and serving as the Medical Intelligence Officer. He also serves as a health information resource for team members. These functions are an integral part of the mission planning process. The team Medical Officer is the commander's conscience and advisor on matters relating to the health of the team.